More and more people use tarot decks for study, meditation, divination or self discovery, but there are still many common myths, misunderstandings, and simple untruths surrounding Tarot cards. Here are some of the more persistent myths about the Tarot that seem to still be around. Notice though, that myths are not necessarily falsehoods. Myths can be symbolic allegories that seek to simplify or explain the human experience. Superstitions are, to me, clearly untrue. The future can become pretty darn certain at a certain point. I promise you that if I put a pot of water on a high heat stove, it will come to a boil. I can change that – I can remove the pot or lower the heat. I can’t predict exactly when it will boil (the variables involve the saline level of the water, the specific material of the pot or pan used, the originating temperature of the water, as well as the altitude at where this is being done), but if nothing is variable I should be rather scientifically accurate in making the prediction of when after numerous trials. But again, nothing about it is written in stone because I still have the free will choice of removing the pot from the stove. Actually, the word “psychic” is just a misused, misunderstood, misrepresented concept that has served to create a whole new “elite class” of people that doesn’t actually exist. The word “psychic” has come to be associated with the notion of “super natural” powers, as if anything could exist above or beyond nature. Psychic really, and originally, merely means “of or pertaining to the mind and soul” (the word soul also being of questionable definition). A conversation with a therapist (psychologist – one who studies (ology) the mind (psyche)) is a psychic experience. A conversation with a priest (who uses the word “soul” to represent one’s inner experiences with the world) is a psychic experience. Politicians use “psychic powers” (words intended to make you feel a certain way no matter what’s actually being said) all the time. Every mammal (and possibly non-mammals for all I know) has “psychic ability.” If you’re thinking, you’re using psychism. If you’re imagining something, you’re using psychism. Reading these words and understanding ways to apply the notions to yourself, your situation, and possibly to your future is a form of psychism. 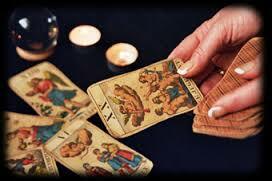 You do not have to be a psychic to read the tarot cards. Like with any skill in life, you just need the willingness to learn how to use the cards, the foresight to understand certain things about cause and effect, and the wisdom to navigate scenarios. Your “psychic ability” (insight) will increase with time the more you study your tarot cards, the more results you encounter, and the more you discover about human nature (including natures that aren’t like your own). For a time in my use of the tarot I actually believed this one. For some reason I was just plain scared that if I told someone I wanted them to pay me for the service, I’d have some kind of harm fall on me. But I also believed the notion that one should be willing to “exchange energy for energy,” so I used to offer my readings on a post hoc donation basis. That is, I told them to feel free to donate whatever they felt was worthy after the reading was finished. A tarot reader who charges for readings isn’t charging you for spiritual guidance any more so than a therapist is charging you for psychological knowledge, they are charging for the time that it takes to impart those things to you. It is worthwhile to pay someone for their time, especially if they have dedicated themselves to always (at least within reasonable business hours) being available to offer you that service. Since I have dedicated myself to this, and I am technically available 24/7 (barring minor variances like shopping time and needing to bathe), and I have to pay several companies money to be capable of providing my services, there’s nothing “karmically’ wrong with charging a fee. In some cases (if you are using reversed cards in your reading) a reversed card can mean the opposite of what it would mean otherwise, but in truth, a reversed card actually means it is weaker or needing a re-examination. And this is where the “intuition” of the reader is necessary the most, because of all the possible ways the card might be influenced by other cards in the reading and the situation itself, the meaning will need to be divined to the best of the reader’s ability. But to simply say it means “the opposite” of what it would mean otherwise is not enough. Some clients have accused me of “ruining their day” because either I didn’t give them the reading they wished to hear or that by giving them the reading I gave them, I’d determined for them that their results were less than hoped for. As if I decided for them that such and such was what had to happen. First, I refer you back to remembering that nothing is written in stone about the future and and second, that I won’t leave you without some way to make choices about that (again, with few exceptions). You must always take responsibility for your life. I will try my best to guide you to the outcome you prefer, but you must own up to the influences within your control in all matters to make things work the way you want them to (provided it is within your power, as there are some things we can never ask for). This is why I tell you that for me, the most important part of my tarot reading spread is called “the influences within your control,” because it will be these factors that determine whether path A or path B is the path you end up going down. I know of lots of tarot readers who buy their own decks. Over the years I have had some decks given to me, and some of those I’ve replaced because of either damage to the cards or someone with less than a full heart decided to steal a card or two because “it was pretty.” Do you think I’d just sit and hope someone would buy a deck for me as a gift because one card needed replacing? No, I just bought a new deck. Also there have been three cases where I wasn’t able to purchase a tarot deck and I drew my own. This is an old tradition, by the way. Members of the Hermetic Order of the Golden Dawn occult society where all required to paint their own decks according to instructions given to them. These became their tarot decks (this was at a time when tarot was not available for purchase). I have a whole shelf full of decks and though I favor two, I do like four of them I use for my own needs, and sometimes I pull one of the other decks that were gifted to me by a lovely artist friend and play with them for myself or personal friends. It doesn’t matter how you’ve come to obtain a deck, what matters is your comfort with the deck’s design and your knowledge of the cards. Oh, and you do need that foresight and wisdom I mentioned earlier. The main argument here is that some people believe you can’t read for yourself. That has to be the most absurd bunkum of them all! I won’t let someone read for me who holds the belief they cannot read for themselves. I can tolerate a belief that they refuse to be objective in their readings for themselves, and they lack enough self-knowledge to do that, but not that it is a rule that must be followed. Why am I so adamant about this? Because every school of occult initiation that works with the tarot requires you a time of self-reading before allowing you to read for others. I think this would be like working on a dummy body before actually being allowed to practice surgery on a living human being. I recommend the old Wiccan “year and a day” tradition at the very least, so that in the end you’ll have had enough experience with each card that your confidence in understanding them in various circumstances and seasons increases your insight into situations. I’ve learned from experience that it is a good idea to ask before touching anything, but there’s no actual “magical” reason this has to be so. If a talisman is properly dedicated to its cause, you shouldn’t fear who touches it because the “charge of the talisman” should inherently protect it from any psychometric phenomenon. There are lots of tarot readers who let their clients do the shuffling, and if there were a way to do this over the phone, I would prefer my clients do the shuffling – but I will cast one aspersion to the idea: while shuffling the deck, the shuffler needs to remain focused on the intent of the reading. An untrained mind can easily lack focus and since it has been a long time since I’ve had anyone but me shuffle the deck, I’m not sure about that phenomenon of “oh, it turns out we’re reading about another question altogether.” Since I am the one who is doing the shuffling, my cards never discuss anything but the focus I was putting on them – so their could be some meat to the notion that it is best to do the shuffling yourself, but other than that there’s no harmful effect to your tarot cards. We can’t say for certain who invented the tarot, but recent historical evidence has put a lot mumbo-jumbo to rest. The earliest known tarot-like depictions can be found in the ancient estates of Renascence nobility and never involved any cards from the minor arcana of the modern deck design. A strong theory exists that these depictions where Biblical in nature and represented allegorical lessons that were often depicted in parades among the common folk and sponsored by the Catholic Church and that the painted versions where for the noble children so they would receive the same stories but without having to rub elbows with unwashed masses. Later historical evidence shows these same depictions being used in a love letter written by one minor nobleman to a woman, written in the form of a poem that “predicts” the outcome their union as lovers. Later, the cards are described in another letter, having been better crafted by printing on wooden stock, and involving the minors, and being used in a game similar to bridge. A hundred years later another letter is written describing them as a fortune telling device, then a few hundred years later Eliphas Levi is the first to discuss them in an actual occult sense and he’s the first to claim they have a Kabbalistic origin. I like this theory far more than origins in Atlantis or Ancient Egypt, where we find zero archaeological evidence to support them. The tarot was not invented holistically, but grew organically. It started as a sort of story book, it morphed over time as it went from the hands of nobility to the common gambler, and in the eyes of an occultist who already had a tradition of the number 22 it was molded into a complete (and as I see it) uniform system. It would be too simplistic for a tarot card to always mean the same thing. Life as a tarot reader would be pretty easy I figure if there were only 78 meanings to express (or 156 if reversed cards only meant the opposite), but look into any book about tarot card meanings and you can find half a dozen or more meanings for each card. Read a different book and you’ll find new ones to add to those. These tarot interpretations are only suggestions, possible meanings, and though I feel some authors have more valid ones than others, a tarot card’s meaning isn’t willy-nilly “whatever I feel at the moment.” There is some validity to the notion that tarot as a system follows rules, but the variety of expressions a single card can offer are only limited by the “imagination” of the reader. I put imagination in quotes there to separate it from the definition of imagination that means “make believe.” What I mean by imagination is the creative talent of the reader as well as personal experience and relationship with the cards. If all one ever knows about The Devil card is that it represents an over abundance of fear and the reader has never had the experience of overcoming superstitious related fear and oppression (such as never allowing someone to touch their tarot deck), they can’t talk to you about the illusionary nature of that fear. If all a reader knows about the five of disks card is that it shows materialism in struggle, possible poverty or loss of wealth, they probably can’t imagine that in the right circumstances it is discussing a kind of loving relationship that wishes to beat all odds against it and survive for richer or poorer, in sickness and in health. No, we can’t just rely on stock imagery or little white books – we need to involve all the expressions of that card’s nature to the best of our ability (again, why I recommend reading for one’s self). You don’t need a birth date to do tarot, you need a birth date to do astrology or if you intend to include “cold reading” methods in your reading. A cold reading is like what Sylvia Brown used to do before she was called out and shown as being fraudulent, it’s where you say things that can be believed by just about anyone – and one way to succeed at this is to know what a person already believes about themselves, such as what their typical sun sign description is. Tell a cold reader that you are a Taurus and they’re sure to discuss your earthiness and groundedness and patience and loyalty. Tell a cold reader you’re a Scorpio and they’ll share with you insights about your adventurous side, your mysterious side, and your vehemence when wronged. It is helpful to know your sun sign in a tarot reading but not necessary. It might add more insight into the reading to know the sun signs of those around you as they may show up in the reading more clearly that way, but it is not required. I wouldn’t suggest you bring sun signs into a tarot reading until after the reading has been issued most fully by the reader, and if you feel it involves a specific person in your life. Say for instance it is a relationship reading. Let the reading be performed for you and then mention what the other person’s sun sign is and ask if that offers any more insight. In short, I’d recommend volunteering as little information as possible until it seems already relevant, but don’t be stone-cold silent – a tarot reading should seem like a dialogue between three parties; you, the reader, and the cards. Here’s one where I’m going to disagree with a widely held misconception by a lot of professional readers and authors. Death means death. It doesn’t mean physical death (usually, although it can I assure you), but it does mean the absolute end of something. A lot of writers on the subject want to talk about butterflies when they see the Death card. They want to tell you about the transformation process, the metamorphosis from one stage to another – they remind me of the Rider-Waite Tarot depiction of Death where the priest is attempting to bargain with Death. I prefer the innocent little girl offering a lily to Death, a gracious acceptance; or, when necessary, the mournful woman afraid of Death. The priest’s effort to bargain with Death appears to be neglecting the two towers and the Sun that can be seen in the far distance on that card – that beyond Death is the promise of this “metamorphosis” that so many writers on the subject prefer to discuss. And where does this “transformation” occur, you ask? Beyond The Moon card and The Sun card in Judgment (or Aeon using the Thoth deck’s naming conventions). Death is death, resurrection is later. When the Death card arrives I relate it as needed in the reading to get you to accept that something is irreversibly over, whatever we discover in the reading that that is. We can choose to bargain with this if we wish, halting our grieving process and failing to accept it, but that’s not usually the psychologically healthy way of dealing with the undeniable ending of something. Death is death and as an honest reader who cares greatly about your success, I refuse to sugar-coat that with butterflies, rainbows, and lollipops.